58467 is rated 3.2 out of 5 by 79. 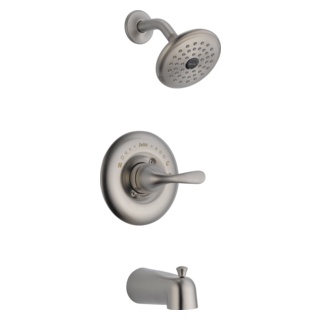 Rated 5 out of 5 by Maemae771 from Great Showerhead I bought one of these a couple years ago. The finish instantly captured me so I had to buy it. After returning home, I installed it and it was very easy to install, took less than 10 minutes. Later on that day I decided to try it out and take a shower. It worked very well. Feels really good on my back and scalp. I definitely recommend. Rated 5 out of 5 by Jacqueline from Great warranty service I, like many others have had issues with the knob on the hand held insert breaking or being no longer movable, but I have always had great warranty service from Delta. I call, give them my name and phone number, and they look up my account. tell them the part is broken, and they send out a whole new shower head. We like the design of the product and greatly appreciate a company that stands behind its product. Rated 1 out of 5 by Shirley from difficult to use hand held feature I have been struggling with this showerhead since we moved into this unit. 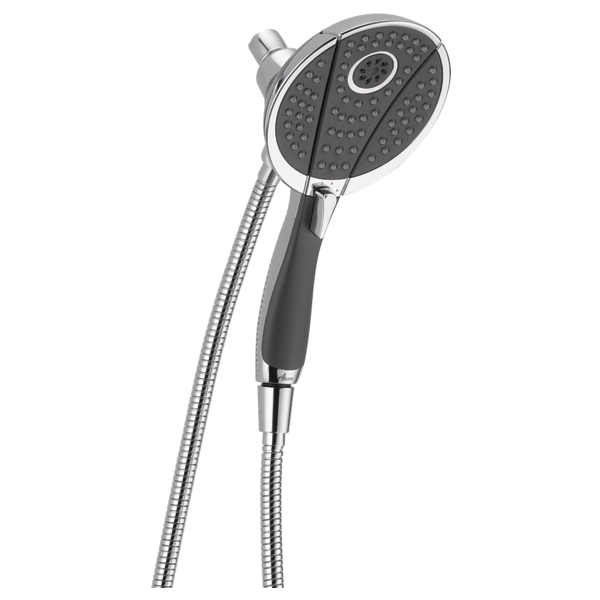 It is very difficult to remove the handheld part of the showerhead and to regulate the flow to the center head. It may be not be an issue if you are 6 feet tall, but the dials to regulate the flow are hard to reach. 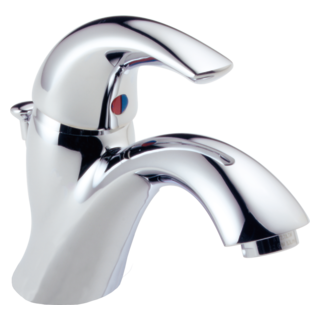 Rated 5 out of 5 by TeddyJim from Another great Delta faucet I had concern with the anticipation of low pressure. Much to my surprise, the pressure is even higher than on the one I replaced. Great!! 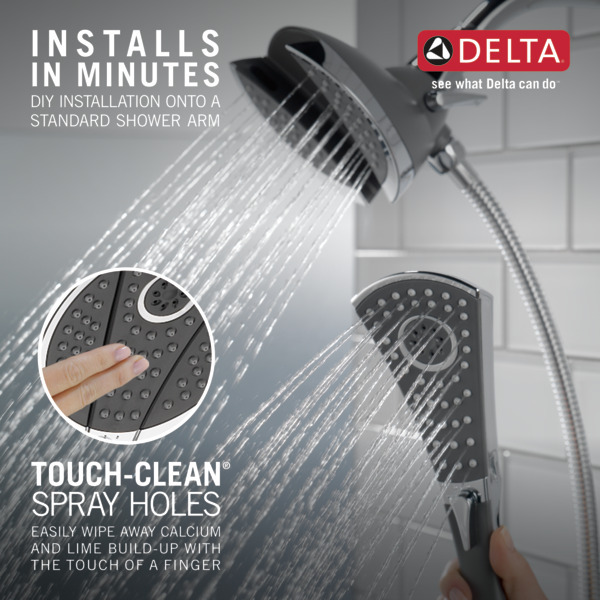 Rated 1 out of 5 by PennyH from Cheap plastic used for critical showerhead part A few years ago I remodeled my vacation home and purchased Delta fixtures for my baths and kitchen based on my plumber's recommendation. 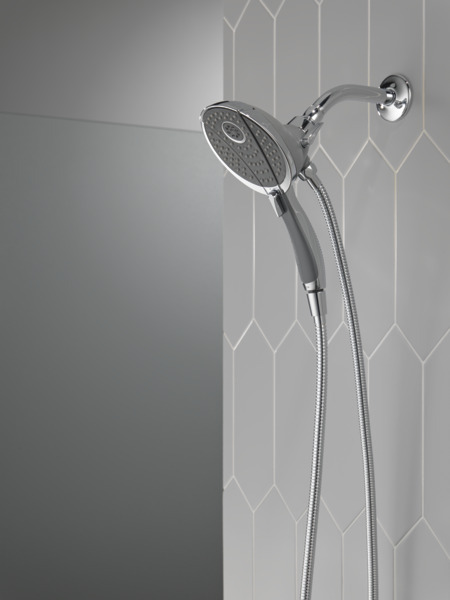 Although it was on the expensive side, I selected this combination showerhead/hand shower for the guest bath for its functionality and appearance. I use the master shower almost exclusively and have never had overnight guests, so the guest shower has been rarely used. 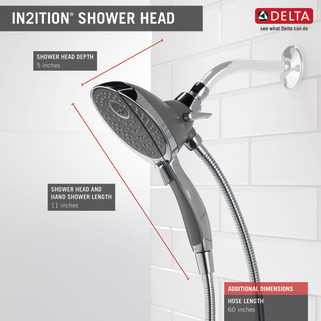 As you can see from one of the attached photos, my Delta showerhead looks practically new. 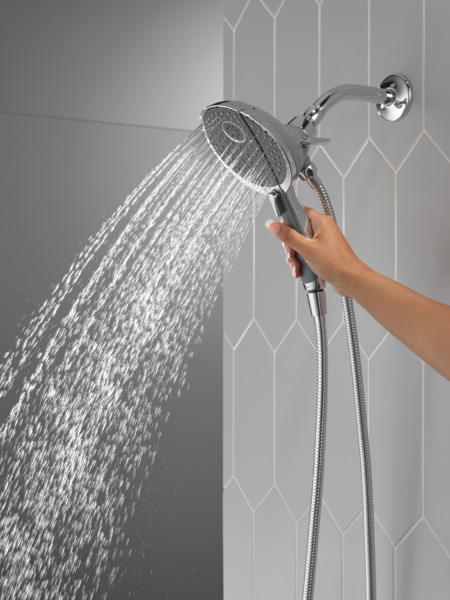 I recently used the handheld portion of the shower in the guest bath to clean the tub and noticed that water was spraying from the back of the showerhead instead of from the expected front. Upon closer inspection, I noticed that there was a hairline crack on the plastic component that basically supports the weight of the showerhead and also allows the showerhead to be adjusted. I then decided to unscrew the showerhead to see if the crack could be repaired using epoxy for plastic. When I tried to unscrew the showerhead with just my hand, the entire thing broke apart. After uninstalling the showerhead, I still tried gluing the broken plastic tube together but my repair attempt failed. I am shocked that Delta uses plastic for such a critical component of a product. The piece that supports the showerhead and allows it to be adjusted should clearly be made of sturdier material. I noticed that a couple of other reviews mention this exact problem. Just an fyi, I am a woman in her sixties who weighs roughly 100 pounds, so it was not by brute force that the shower head broke. Rated 1 out of 5 by Notnorbert from I would like it much better if it didn't leak from There's much to like about this design, but the one I purchased has a serious problem. The seam between the two parts of the wand handle is leaking water. I'm pretty sure that's not meant to happen, and it reduces pressure to the wand spray head. Rated 5 out of 5 by LindaD from Love this!!! We installed this in our guest bathroom and recieve raving reviews from all of our guests. We love it more than the master bath shower and "visit" the guest bath from time to time in order to have the experience. We installed it 7 years ago and have had no issues. Rated 5 out of 5 by mredd6 from Excellent Shower Head Combo This latest purchase was actually a warranty replacement. 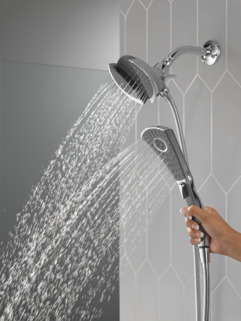 We had the earlier version of the 2 in 1 shower head for many years. The new version is much better designed than the original. Thanks for the great customer support and a great product. We've installed a new 58467 shower with the removable handle. Water comes out the handle part but not the main part. There is nothing in the instructions so we need to know how to make water come out the main part of the shower head. Thank you for your question. 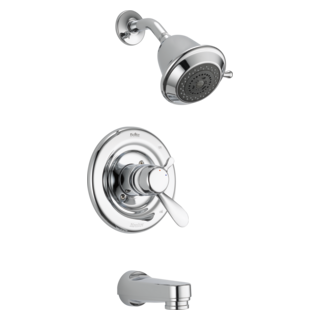 Delta Faucet model # 58467 has lever on the front of it that you can use to switch modes and between the hand shower and the stationary shower. I have this Delta shower head, Delta Classic In2ition&reg; 4-Setting 2-in-1 Shower System - 58467. The plastic lever that switches the water mode has broken because there was too much force required to turn it. Can I order a replacement? I called to ask about the same piece. If it's the plastic part connected to the shower head, then no, but possibly if it's the gold piece.If it's under warranty, they'll replace it for free. Can I order a replacement hose? The end that connects to the handheld shower has cracked? Which top shower arm and bottom lever to match this? I need to have the Moen set in my stall shower changed to this shower head and corresponding brushed nickel/stainless steel accessories. Which top shower arm and bottom lever can I choose to match this? Thank you very much. Thank you for your question. Delta Faucet model # 58467-SS will be replacing your existing shower head. It should be a standard size showerarm but I am not sure with Moen products. 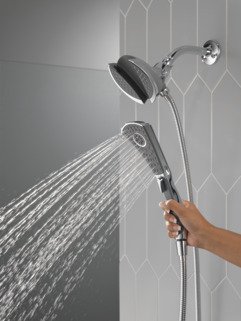 What is the mechanism the connects the handshower to the shower head? Magnetic? A clip? Something else? That's all I want to know if this unit is made in the USA. I am interested in buying this one if it is.